reducing fuel within 30m of your home - see more below.. In order to make it easier for people to protect their homes, the laws in Victoria have been temporarily changed to incorporate the '10/30 right'. This gives homeowners 'the right' to clear ANY vegetation (including trees) within a 10m distance of their home, without a permit. Any vegetation, excluding trees, can be removed up to 30m distance from your property- so long as it is within your property boundaries. Regarding boundaries- property owners can remove vegetation either side of a property boundary to a combined width of 4m (essentially 2m either side). CFA website . The 10/30 right applies in the majority of councils across Victoria. Banyule, Bayside, Boroondara, Brimbank, Darebin, Glen Eira, Greater Dandenong, Hobsons Bay, Kingston, Knox, Maribyrnong, Maroohdah, Melbourne, Monash, Moonee Valley, Moreland, Port Phillip, Port of Melbourne, Stonnington, Whitehorse, Yarra. 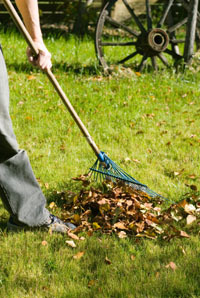 In my local area FREE garden waste drop offs are being offerred to help residents clear their properties of tree prunings, leaf litter and garden clippings. Fire reduction burns are taking place, along with other intensive fire reduction works throughout shires across Victoria. These include roadsides, bushland reserves, fire breaks, fire tracks and water tanks.